The Vancouver rock band The Collectors, was formerly named The Classics who were a Vancouver group led by Howie Vickers in the mid-60s. The Classics were part of the regular line-up on Let’s Go, a show on CBC TV. Though the Classics released several singles the group needed room to grow and reformed as The Collectors. They would become one of the most innovative of Vancouver’s recording acts through the rest 60s. In the spring of 1967, Vickers was asked to put together a house band at the Torch Cabaret in Vancouver. Along with Claire Lawrence on horns, they recruited guitarist Terry Frewer, drummer Ross Turney and Brian Newcombe on bass. Within a couple of months, fellow Classics member Glenn Miller replaced Newcombe on bass and Bill Henderson, a student at UBC, replaced Frewer on guitars. With Vickers now handling vocals, their sound changed from doing covers of R&B tunes to psychedelic rock. This led them to gigs along the Canadian and US west coast. Their strongest fan base in America was in California. There audiences welcomed their complex arrangements mixed with harmonies and extended solos and musical ad-libs. The band headed to Los Angeles to make some recordings with Barry De Vorzon at Valiant Records. Music critic, Richard Skelly (Richmond Review, Radio West.ca, RPM Magazine), reveals that the “band didn’t have an actual name when they demoed a few songs for New Syndrome, a production firm owned by singer Tom Northcott and entrepreneur Jack Herschorn. An American ex-pat, Herschorn pitched the demo tape to assorted Los Angeles labels. Valiant bit…and brought the band down for some initial sessions. At the time, the boys were honing their style by playing behind amateur strippers at the Torch Cabaret. … patrons simply called them “The Torch Band.” After recording “Looking At A Baby”, Valiant (probably De Vorzon himself) gave them two options for a name: The Connection or The Collectors. Not so coincidentally, Valiant’s other up-and-coming band was called The Association.” Howie Vickers recalls “We couldn’t agree ‘collectively’ on a name…They were about to press the record and (so) The Collectors it was.” Out of the recording sessions with Valiant Records, The Collectors had two singles that made the Top 40 in Vancouver in 1967. The first released early in the year was Looking at a Baby”, followed in August ’67 by “Fisherwoman”. “Fisherwoman” climbed to #15 on C-FUN. It was ascending up the chart when C-FUN decided to stop publishing The Fun Forty and move to an MOR radio format. 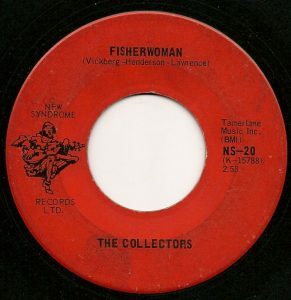 “Fisherwoman” also climbed to #21 in KOWN in Escondido, California, just north or San Diego. 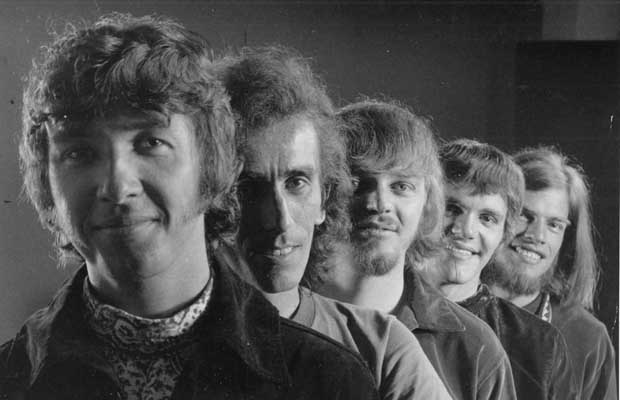 In 1968 The Collectors had another Top Ten hit in Vancouver with “Lydia Purple”. Several more hits followed at the end of the decade including “Early Morning” in 1969, and “I Must Have Been Blind” in 1970. After Howie Vickers left the band in 1969 they were in the process of reforming. Before 1970 came to a close they named themselves Chilliwack, a Salish Native Canadian name meaning “valley of many streams.” It is also the name of a city in the Fraser Valley, east of Vancouver. Chilliwack had their first Top Ten hit in Vancouver with “Lonesome Mary” in 1971. According to Skelly, Chilliwack’s record company, A&M, “fumbled by wasting “Ridin’” as the flip side to “Lonesome Mary”. An ode to train travel, it had a jangly Byrds meets CS&N vibe. Unfortunately, “Ridin’” was the only obvious followup single. Likely, realizing the mistake, A&M supposedly flew the band down to whip off a pair of straight up rockers: “Hit Him With Another Egg” and “Rock n Roll Music”. I never heard the finished but never-released product.” Skelly writes that later re-recorded versions of these songs ended up as tracks on a subsequent album, All Over You, but these were not as good as their first recordings. Chilliwack released three albums between All Over You, Riding High and Rockerbox between December 1972 and December 1975. Aside from “Crazy Talk”, from the Riding High album, their single releases received minor attention outside of radio markets in BC. In January 1977 the band recorded their sixth studio album, Dreams, Dreams, Dreams. At the time the band members were all involved with Scientology and there was a dedication to the founder of the Church of Scientology, Ron L. Hubbard, on the back of the album. By 1977 the bands musicians consisted of Henderson, Turney, Miller and Howard Froese on guitar, vocals, solina and piano. The album included several successful single releases in the Canadian market that included “Fly At Night”, “California Girl” and “Baby Blue.” But it was the band’s ninth album release in 1981, Wanna Be A Star, that took them to the pinnacle of their success. The single “My Girl (Gone, Gone, Gone),” went Top 30 on the Billboard Hot 100, #3 nationally in Canada and #1 in Vancouver. Bill Henderson has continued to perform in concert including concerts featuring the music of The Collectors and Chilliwack. For years Howie Vickers had contracts writing advertising jingles at Little Mountain Studios in Vancouver. Going by his real surname, Vickberg, Howie, served for several terms on the municipal council of the Township Of Langley. Claire Lawrence went on to play with many recording acts including Shari Ulrich, Connie Kaldor, Roy Forbes, Susan Jacks and others. Lawrence produced The Great Canadian Gold Rush show on CBC TV in the 1970’s. He also scored the music for the popular CBC TV show The Beachcombers, between 1986 and 1990. More recently, he produced Jazz Beat on CBC from 2000 to 2006. Glenn Miller died in 2011 of complications related to muscular dystrophy. He had spent several decades in Toronto helping people get off drug addictions. Bill Henderson, The Collectors, Canadian Bands.com. Tom Harrison, Glenn Miller R.I.P., Vancouver Province, Vancouver, BC, March 10, 2011. Richard Skelly, email(s) to Ray McGinnis (and thanks to Bill Henderson for clarifying “fiery furnace” begins the last line in the final verse).